So rumors swirling Rian is off this and it’s been scrapped. The source is coming from a guy who posted it on his wordpress blog. I wouldn't give any credibility to this rumour at all. 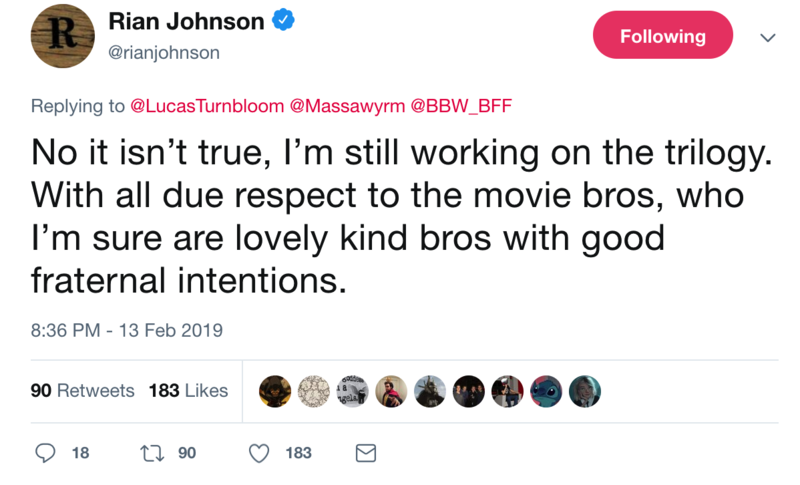 Jordan Maison who is a reliable Star Wars scooper said he heard these rumblings 6 months ago and after that it wasn’t mentioned by Iger when discussing the future but mentioned Benioff and Weiss. There’s smoke certainly. Making Star Wars claims false. That'll make Star Wars fans happy. It'll make plenty of them happy actually. Mostly among the new generation of fans. The same group that awarded Jedi with an "A" on cinemascore, 89% on comscore, and 47.5% of IMDb voters who rated the film 8 or higher as well as Empire readers who picked it as the best movie of 2017. It will be funny to see 30 000 0/10 on IMDB the Tuesday before release. I think some will already make some noise for Knives Out. I just hope they don't realise there's an animation picture about two badass sisters (or Mary Sue in their vocabulary) in the next room. Jokes aside I really want him to make big blockbusters again, but not necessarily SW.